The Hindu culture and mythology is definitely the great one. It always lead one towards the path of Dharma (in broad meaning), Krama and Truth. It is the culture which always encourage the people use their wit and ask questions, rather than following anything unknowingly. The greatest treasure of knowledge for the mankind – Shrimad Bhagvad Geeta (aka Geeta) – is also a questionnaire between Krishna (pronounce: Krushna) and Arjun. It is the culture which always respected the inner voice of a person, the curiosity to know the truth and follow the truth and only the truth. Based on the great values of the culture – even the modern day Republic of India have the slogan – Satyamev Jayate (Truth Only Triumphs) on the national symbol. The Indian literature have the history of thousands of years. The Vedas, Puranas and Upanishadas are full of knowledge, wisdom tales, and other forms of literature. Sagas like the Mahabharat, the Ramayan are in the poetic forms. Sanskrit ( Pronounce: Sanskrut) is one of the richest language in terms of literary and linguistic aspects. The remarkable amount of knowledge is consolidated in these books. That is why we wrote the first lines – “it is concealed”. One need to perform a treasure hunt to know it!!! Dr. ChandraPrakash Dwiwedi – the man behind the Hindi TV Serial – Chanakya (which was acclaimed for various aspects and authenticity of the same – came with another masterpiece. 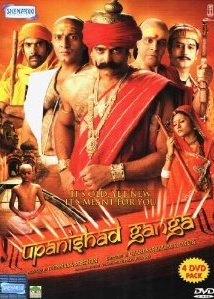 He made a TV Serial named Upanishad Ganga which was aired in year 2013. It contains 52 episodes and the first one was aired on DoorDarshan on 11th March 2012. The TV serial is available as the set of DVDs and even can be bought in separate parts as Volume 1 and Volume 2. So those who missed it during the initial broadcast OR those who want to possess this nice TV Show forever in their personal home library, can go for it! The other good thing is, all the episodes of this Upanishad Ganga are available to watch for free on YouTube. Over the period of time, we will be reviewing all the episodes of this nice TV Serial and present our views about the same. Here is the summarized episode wise table of content for the same. What are your views about this TV Serial? Do you like this review? Do not forget to share this article with your friends over various social networks via Twitter, Facebook, Google Plus and others. And yes, you may like to subscribe to our RSS feeds and follow us on various Social networks to get latest updates for the site to land right in your mail box.